You can queue for differnt/multiple roles for differnt dungeons/raids. Everything is taken from server to work as new dungeons and raids are added. 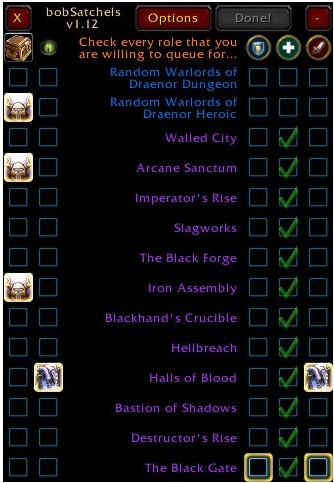 Shows you all the LFD/LFR raids available so that you can make your choice as easy as possible. Ability to queue for LFR "Rewards First", making ALL LFR rewards queued first over other satchels. Supports all minimap button collectors addons. Has the option to auto open satchels! Comes with a loud mp3 queue alert. The mp3 file makes it customizable by you! Fixed an issue with option buttons being unclickable. Fixed an issue with PlaySound that Blizzard changed in patch 7.30. Fixed an issue where you could attempt to queue for roles outside of your class. Fixed an issue with window open/close sounds during combat with auto hide turned on. Added an option to turn the flashing of WoW in taskbar on/off when queues pop. No longer changes minimap button icons after startup so will no longer interfere with addons that reskin the minimap buttons. Fixed an issue with the curse client where bobSatchels.mp3 was being replaced if you changed it. Added a display on LFRs when you hover over the name to show loot progress details. Added an option to auto hide the GUI when you are in combat. Added an option to alt-click to quickly disable scanning and queueing. You may now click the tank, healer or damage icon to toggle all. When clicked it will uncheck all. If all were unchecked before clicking it will turn all on. Fixed bug that showed some LFR that were not really open yet or available to you yet. Seems Blizzard has removed the ability to queue multiple dungeons in 1 keypress, in response we no longer try to queue more than once per keypress. I have reduced the queue cooldown from 10 seconds to a dynamic cooldown. The cooldown starts at 0 and everytime you hit the queue button 1 second is added to it. When you successfully queue it is reset back to 0. With this you can queue 6 in less than 30 seconds. I have added an option to show progress in LFR by adding (#/#) to the names. Removed the auto-remove from queue feature as it is no longer needed. After testing I have found that when you queue for a satchel you are now locked to getting a satchel in that role on that dungeon/LFR. If the satchel reward "disappears" it only applies to future queues. I have changed my code to work with this and when you queue for a satchel, it will remain "locked" on the GUI. When the queue pops it *MAY* not say in the listed rewards that you will be getting AP/satchel, but trust me, I have tested this alot, you will get your satchel. The bug "1517: bad argument #1 to 'tostring' (value expected)" should be fixed. Fixed the "Auto Open" option to work with the new satchels (and any future satchels). Fixed a display bug that caused the new rewards to not show the icon properly. Fixed a display bug that happens when you level and you lose or gain instances. Added a tooltip to the rewards icon, so you can know what your going to get! Added ability to force queues, regardless of satchel, by clicking the box under the eye. The "Auto Leave" feature will not interfere with forced queues. Added more information and functionality to the queue popup. It actually is nice now! Added queueing priority to queue for rewards + satchels before just satchels by default. The "Rewards First" option still there, no change, still forces you to finish *ALL* rewards. Added the ability to move and remember the position of the queue popup button. Holy! Ok, queue selection should be completely fixed, sorry about that! Added option for creating a minimap button specifically for minimap addon button collectors. Added option to flash the minimap button to alert when a queue is ready. Added option to automatically open satchels in your inventory. Added a couple minor tweaks to UI to show active instance and bad/lost queues. I believe I have fixed the "raid lag" problem. Please report to me if you have any issues! Added special support for MBF (Minimap Button Frame). The icon will always show up in MBF. The "Minimap button" option shows you a button, on the minimap, that you can turn on or off. The "Auto Dock" option always docks to "Minimap button", even if the option is turned off. Added an option to use a minimap button and an option to auto dock the UI to it. Changed the default for "Auto Leave" to be off when you first use the addon. Fixed a problem where the UI window was not remembering where you placed it. Fixed a problem with the queue popup staying on the screen even if you turned it off. Fixed a problem with it thinking you can queue when you are already in a raid. Added tooltips to the Minimap button and the LDB button. All options have been moved to the blizzard interface options panel. Added an options button. The queue button attempts to queue 3 LFD/LFR at a time per click. You will usually only get 2. Made the UI screen a little thinner. Now highlights where any bonus is available, even if you can not queue for it. Now uses a bobSatchels.mp3. You can place any mp3 in place of bobSatchels.mp3 and restart. Added an option to show a queue pop in center of screen when queue becomes available. Added an option to auto remove yourself from bad queues and bad queue pops. Minor tweaks to UI, highlighting/alpha. Minor bug fixes. Please leave a comment if you find any problems! LDB! LEFT CLICK: queue, SHIFT LEFT CLICK: unqueue ALL, RIGHT CLICK: show/hide UI. UI now shows you which dungeons and raids have valor available. UI now always lights up which roles have satchels available. UI has been given a makeover with new icons. Changed "Require Rewards" to "Rewards First", requires all LFR weekly rewards first. Shows if your in queue, and if you are, it is clickable to remove yourself from that queue only. Queue information is now gathered in the background, allows queueing without UI shown. UI window is now click-through and will not "jump" when minimzing/maximizing. Smaller, tighter interface, with minimize ability. Queue throttling (minimize wasted clicks on queue button due to throttling on server side). Remembers visible state (shown/not shown/minimized/not minimized). First at all, nice idea! But Second -> why no Ticket function?!? overlap with the Original Icon on Square Minimap Buttons. I am using ElvUI with the Square Minimap Buttons from ElvUI Enhanced Again (Legion) Screenshot below. Why you don't use a Icon Library like other AddOns do? They are using this Library.